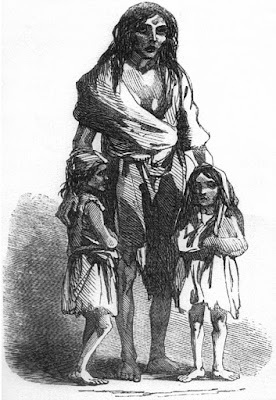 IrishAmericanJournal.com: "No Irish Need Apply"
The Irish, especially Irish Catholics, were terribly discriminated against and oppressed in their own land of Ireland when it was forcibly occupied by the British Empire for 800 years. There were a series of British laws which denied equal rights to Irish Catholics from the Statutes of Kilkenny in 1367 AD to the Penal Laws of the 17th, 18th, and early 19th centuries. The British political statesman and philosopher Edmund Burke once described the Penal Laws as, " ... a machine ... of impoverishment and degradation of a people and the debasement in them of human nature itself, as ever proceeded from the perverted ingenuity of man." the English political magazine called "Punch"
But the worst oppression was yet to come. From 1845 to 1850 the potato crop in Ireland failed. A fungus destroyed the only source of food available to most Irish peasants. There was an abundance of other food in Ireland, but it was controlled by the British who denied it to the starving Irish. One million Irish starved to death in their own country and another million sailed away to permanent exile to other lands, mainly to the United States. as depicted in 1849 in the publication Illustrated London News. controlled by the British overlords who would not share it with the Irish. million Irish sailed away mainly to the USA. As a result while today there are about 5 million Irish living in all of Ireland, there are about 40 million Americans who claim Irish ancestry. The United States has become the new homeland of the Irish people. In addition to the USA, Irish emigrants also went to Canada, England and Scotland, and Australia -- where they also faced discrimination. Today, and especially since the election of President John F. Kennedy, the Irish are fully integrated into American society. But they were not welcomed at first. 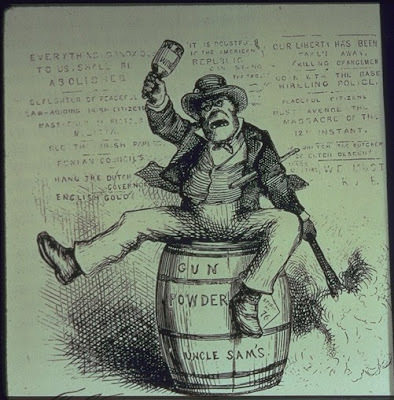 There was much anti-Irish and anti-Catholic sentiment in America in most of the 19th and early 20th centuries. 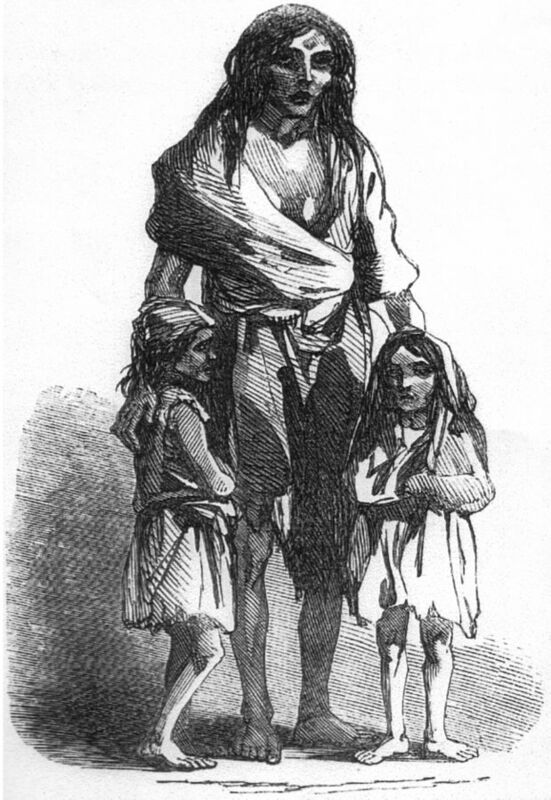 Irish immigrants were discriminated against in employment, housing, and in society in general. Signs saying "No Irish Need Apply" or "NINA" were common in many large American port cities in the 19th century. 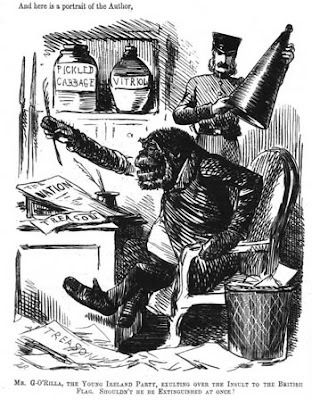 Political cartoons in prominent newspapers depicted Irish Catholics as animals, especially as apes, and as violent drunkards. Bigoted people saw the Irish Catholics as too foreign, untrustworthy, troublesome, and followers of an alien religion. Many publications printed political cartoons and news stories that were blatantly prejudicial, insulting, and hateful against the Irish. In response a song came about telling the story of an Irish immigrant's reaction to this prejudice. The first version was of a male immigrant, but later there was another version for a female immigrant. A male Irish immigrant was often derisively referred to as "Paddy," and a female was called "Bridget." In the mid 1850s (the exact date is uncertain), a man named John F. Poole wrote the lyrics to a song named "No Irish Need Apply." It was published by H. De Marsan in New York. (See more at the Library of Congress.) It tells the story of an Irish immigrant, newly arrived in America and eager to go to work. But when he arrives at the place of employment, he is told by the boss, "...you are a Paddy, and no Irish need apply." The song goes on until the Irishman decides to "persuade" the boss to hire him and never say "no Irish" again. In 1862 a new version was published but the main character was an Irish woman who emigrates to England or America. She faces the same form of discrimination as the Irish man in the original song. The author of the song was purportedly a second generation Irish American named Kathleen O'Neill, although this is not certain. It was published in 1862 in Philadelphia by J.H. Johnson. Here are the lyrics to the first stanza of the song "No Irish Need Apply." You can find the rest at this link. I want a situation: yis, I want it mighty bad. But the dirty spalpeen ended with: No Irish Need Apply. Whoo! says I; but that's an insult -- though to get the place I'll try. So, I went to see the blaggar with: No Irish need apply." And here are the words to the first stanza of the female version of the song. Find the rest here. Also at the Library of Congress. For I read in each advertisement: "No Irish need apply." How they insult us when they write: No Irish need apply." of the song "No Irish Need Apply"
Both of these songs became popular and helped address this issue of unjust discrimination. It is no accident that they appeared around the time of the American Civil War. Irish in the Union Army in the American Civil War, circa 1862. Most likely the 69th New York Regiment, taken in Virginia. Confederate Army during the war, 1861 to 1865. Many thousands of Irish immigrants served in the Confederate and Union Armies and proved their courage and loyalty to America. About 30,000 were in the Confederate Army; and over 150,000 were in the Union Army. More than anything else, the service of Irish in the American Civil War, especially in the Union Army where most of the Irish were, set the Irish immigrants on the road to acceptance as loyal and respectable American citizens. A final thought: The only good thing that can come from such a history of persecution and discrimination is that perhaps the Irish people, and maybe all people everywhere who care about human rights, will be more sensitive to issues of prejudice and intolerance and treat all people, regardless of their background, fairly and with justice and compassion. Sources and Further Reading: Library of Congress "No Irish Need Apply" original manuscript song sheet; Wikipedia's article on Anti-Irish Sentiment; Georgetown University article on the song. Here is a link to Don McLean's version of "No Irish Need Apply," performed live in Ireland, at youtube.com.